Middletown Fire Company No. 1 provides fire protection, fire prevention and emergency medical services to Middletown Township, located in Delaware County, Pa. along with our sister company, Rocky Run Fire Company. With 40 active members and 5 pieces of fire apparatus, the fire company serves the township's 13.5 square miles and 20,000 residents. US Highway 1, a major thoroughfare, runs through the township. Middletown Fire Company is a Participating Department in the Certification Program through the Pennsylvania State Fire Commissioner's Office. 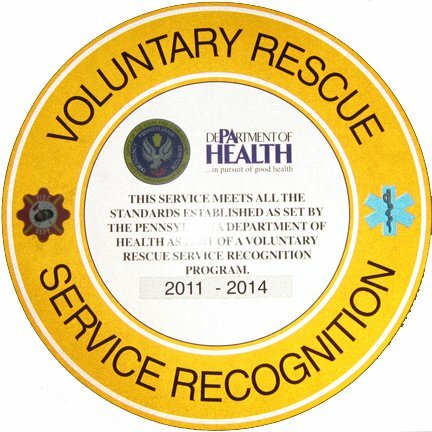 As the designated township rescue company, Middletown Fire Company, in 2013, was the first fire company in Delaware County to earn the Pennsylvania Department of Health's Voluntary Rescue Service Recognition, which recognizes strict levels of certification, proficiency and emergency response. The First Fire Equipment: Ten Red Buckets. According to older residents, it all began with an informal gathering of residents. Their meeting place was the woodpile at the home of William Borton, the village's founder. Less than a dozen residents decided the area should to have it's own firefighting unit. Out of this decision came the Bortondale Fire Company, later to become the Middletown Fire Company. Bought Hose Cart: The residents accumulated enough cash to purchase a two-wheel reel holding 500 feet of hose. It was pulled by hand. The First Fire House: Mr. Borton had a small firehouse built to house the cart on Howarth Avenue. The apparatus had no pump. Water pressure was supplied by the few fire hydrants in the town. Only one stream of water could be played on a fire at a time, since the equipment included just one nozzle. After about two years of using the hose cart, The Middletown Firemen bought their first motorized apparatus in 1922. (No picture available at this time). It was a Ford Fire Engine with a 350 gallon per minute (GPM) pump. Soon afterwards, the residents began work on a firehouse at Bortondale Road and Oak Avenue (Levis Avenue). The volunteers did almost all the construction themselves, working day after day in three teams. The job was finished in 1925. Bought New Apparatus: In 1926, The Middletown Fire Company replaced its engine with a Reo Pumper (shown below). This carried a 350 GPM pump. This truck served the community until 1942. In 1942, an American LaFrance 500 GPM Pumper was purchased, which carried 200 gallons of water and 1,400 feet of hose (shown below). In 1952, Middletown became a two apparatus company when a second truck, a 1952 Dodge American LaFrance 500 (GPM) Pumper with a 300-gallon booster tank, was purchased. The 1952 Dodge American LaFrance is shown in the foreground and the 1942 American LaFrance 500 Series Pumper is shown behind the 1952 Dodge. In 1961, The Middletown Fire Company purchased a 1961 American LaFrance 1000 (GPM) Pumper with a 500-gallon booster tank. This unit remained in service until it was sold to the Felton Fire Company on Highland Avenue in Chester, PA. This unit was in service as unit 501. This unit is currently owned by the East Lake Fire Department Station 57, Palm Harbor, FL. These pictures are courtesy of the Fire Department and their webmaster, Lt. Bill Edling, and much appreciated. Thank you. Old Fire House in Bortondale Replaced: Members of the company decided in 1962 their current firehouse has outlived its usefulness. The volunteers voted to replace it with a single story 60ft-x 60ft masonry building. The new firehouse was built on the present site of the old two-story wood frame structure. The firemen had considered renovating the existing building, but found the cost too great. Construction of the completely new firehouse located at Bortondale Road and Levis Avenue was expected to require $35,000. The company financed part of this with a $20,000 mortgage. The new structure had four engine bays to house apparatus. There was also a kitchen and a small recreation room. This building was completed in 1964. In 1968, The Middletown Fire Company purchased a ChevroletHahn Pumper with a 1000 (GPM) pump and a 500-gallon booster tank. This unit remained in service until and was sold to a fire apparatus dealer in Arkansas in the mid 1980's. This unit was in service as unit 502. In 1972, The Middletown Fire Company purchased an InternationalJohn Bean FMC high pressure fog truck, this was a primary attack vehicle with a small 70 (GPM) PTO Pump at high pressure of 850 PSI and a 250 gallon booster tank. This unit was in service as 504. The members overhauled this unit into a closed back unit with a 250 GPM pump and 250-Gallon booster tank. This unit remained in service until December 2002, and was sold to a private owner in the Boston, MA area. In the Mid 1970's, The Middletown Fire Company purchased a 1971 CJ-5 4-wheel drive Jeep, this was outfitted with a 60 gallon booster tank and a gasoline powered pump. This unit was primarily used as a brush unit and also was equipped with a 6 ft. plow for snow removal. This unit was in service as 508. In 1976, The Middletown Fire Company purchased an American LaFrance Century Series, 1500 GPM pumper with a 500-gallon booster tank, and a 50 ft. Snorkel Tele-Squrt Aerial Device. This unit remained in service until 1998. This was in service as 503 and was sold to the Vinemont-Providence Fire Company in Alabama. It has since been sold to another Department in Alabama. In 1981, The Middletown Fire Company purchased an American LaFrance Century Series Pumper with a 1500 GPM pump and a 1000-gallon booster tank. This unit remained in service until early 2002 and is currently owned by the Washington Fire Department in Marion, Indiana. In 1986, The Middletown Fire Company purchased an International, Grumman, FireCat all wheel drive attack pumper with a 1000 GPM pump and a 500-gallon booster tank. This unit is currently in service as unit 501. 1986 Grumman at new station on South New Middletown Road (Route 352). Modified by members of Middletown Fire Company. New Building Construction: In 1991 the volunteers once again were exploring possibilities to either expand or re-locate the fire station in Bortondale. After many years of searching for a appropriate location, the parcel of land owned by the State directly behind the old Roosevelt Elementary School and PennDot yard was identified as a desirable location for both access for members and access to the main NorthSouth corridor Rt. 352. State Representative Matthew Ryan and the Late Senator Clarence Bell were the main forces behind acquiring the land from the State and finding grant money to pay for the 1.63 acres. The current building has four bays, of which two are drive through (double deep), an engineers' room, communications room, small kitchen, recreation room, and a combination meetingtraining room known as the community room. The total square footage of the new building is 9600 sq. ft. The total project cost was $750,000, about half of what it would have cost to hire a general contractor to build the building. Once again the membership chipped in to save money by overseeing the project management and doing some work on our own. The membership put in over a year of time to complete this project. Middletown Township helped the Fire Company obtain the loan by co-signing the loan. The Middletown Fire Company has the burden of paying the loan payments. One of the last parts of the projects was to obtain access to South Old Middletown Road from our station. Once again our State Representative and Senator were invaluable in dealing with Harrisburg and PennDot. The access road is open for EMERGENCY VEHICLES ONLY, fire apparatus and members going to and from the station. The officers and members would like to thank all the contractors for their assistance and great work during the construction and their efforts to help the Middletown Fire Company improve and maintain the facility. This facility was occupied in 1996. In 1998, The Middletown Fire Company took delivery of it's first apparatus paid for through the Middletown Township apparatus fund, a 1998 SpartanSaulsbury Pumper 2000 GPM with a 500 gallon booster tank, and a 30 gallon Class "A" foam tank, a 65 foot Aerial device, Snorkel (Tele-Squrt). This unit is currently in service as TS50. In 1999, The Middletown Fire Company purchased a Ford F-350 super duty 4 door cab unit, with a stahl utility body, it functions as a Utility and is licensed through the State as a QRS (Quick Response Service) for medical emergencies. It carries oxygen, a defibrillator (AED) and other trauma and medical equipment. The unit also is equipped with a snowplow for clearing our lot and access road. This unit is currently in service as 50-8QRS50. In 2002, The Middletown Fire Company took delivery of it's second apparatus paid for through the Middletown Township apparatus fund, a 2002 Pierce Dash 2250 GPM pumper with a 1000 gallon booster tank, 30 Gallon Class "A" Foam and 60 Gallon Class "B" Foam, this unit is currently in service as unit 50-2. In 2002, The Middletown Fire Company took delivery of a Pierce Enforcer, which is a production model version of the Dash, a 1500 GPM pumper with 1000-gallon booster tank. This unit will be in service by early January 2003 as unit 503. In 2009, New radio designations were put into effect. The county approved the term Squad for apparatus. A Squad is an Engine with a full complement of vehicle rescue tools. The Company decided to rename 50-2 as ' Squad 50' and 50-3 as 'Engine 50'. It was determined it would better identify the capabilities of the two units. Do you know the difference between a #Flood Watch and a #Flood Warning? Knowing what these terms mean can help you make important safety decisions.